The OMR Sheet is a technical document that is designed as per strict rules and parameters. In the past, the process of designing the sheets was tedious as well as lengthy. These were designed using Corel Draw, after which they were calibrated at a high resolution in the OMR software. It was necessary to calibrate each bubble for accurate reading. However, this is not a full proof method to get flawless OMR sheets. The accuracy of the OMR sheets would vary from designer to designer. 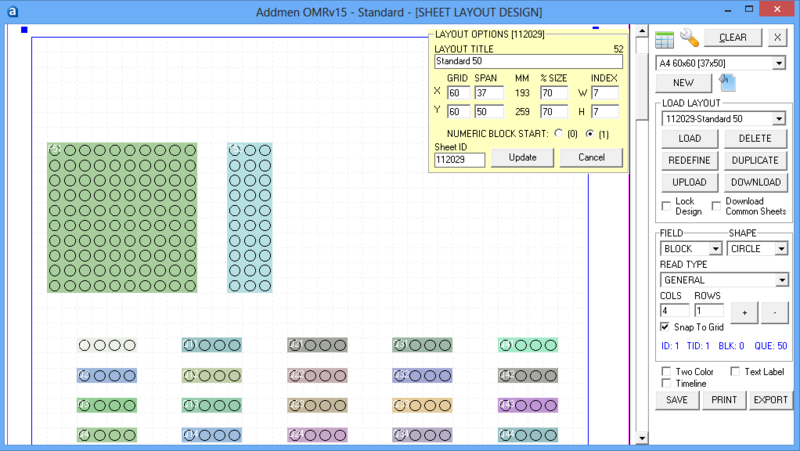 However, the OMR sheet designing process is no longer a tiresome task, thanks to Addmen's OMR software. The OMR sheet design software is built mainly to process the scanned OMR sheets. Along with this, it also has an inbuilt ability of designing OMR sheets. You can design different types of OMR Sheets with this software. Be it an OMR answer sheet, an application form, a questionnaire or any other OMR form, you will find solutions for each of these designs. The OMR software is the easiest tool for designing OMR sheets. You can create the sheets using the drag and drop method. Moreover, the sheets are calibrated automatically during the designing process. So you do not have to spend time for calibrating the sheets. The best part is that you do not have to pay extra for this facility. It comes with the OMR software. In the past, the OMR sheets had to be printed in two colors. However, today, this is not a necessity. The OMR software can design as well as read black and white OMR sheets. Nevertheless, colored OMR sheets can be designed with the OMR software. With this note, let us take a look at the amazing features of the OMR sheet designer. The sheet designer software has the ability of designing OMR sheets of both old and new OMR pattern. You can create OMR sheets of various designs with this designing software. The OMR sheets can be designed and printed in a range of sizes. From stamp size to A3 size, you have the liberty to design different sizes of OMR sheets as per your requirement. No special printing machine is required to print these OMR sheets after designing. You can use a laser or inkjet printer for this purpose. You do not have to worry about making errors while designing the OMR sheets like in the case of the old OMR designing technology. The process of OMR sheet design is very simple and can be done without making any mistakes. With the OMR sheet design software, you do not have to rely on anyone to design and print the OMR sheets as you do not require any special tools, printer or thick papers for this purpose.